Tag Archive | "car crash"
Few people know about the Ecuador pain reduction center in Cotacachi. Merri and I love to be outdoors. 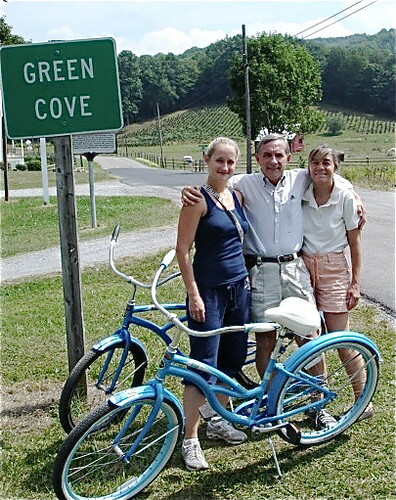 Here we are riding the Virginia Creeper Trail with our daughter Eleanor. 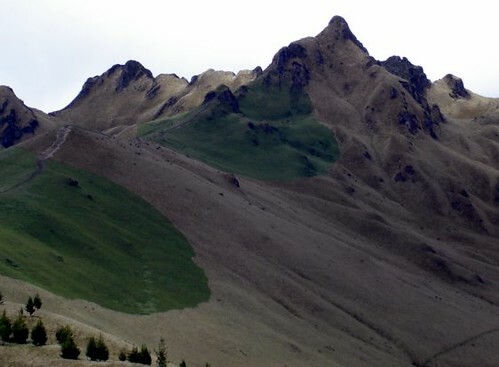 Yet for some time my hiking and riding had been hindered by pain. I found something exciting to resolve this pain. Learn about it below. In these mountains above Lake San Pablo and Otavalo. Ecuador has a pain secret. Here I am hiking with Merri and Ma in NC. I get numerous letters from readers like this. (used-to-be) “bum” leg. I can now walk much longer distances and remain pain free! Every pain free day in life is a gift…a fact that in the hustle and bustle of living is easily forgotten. I know from experience. See www.garyscott.com car crash if you missed how a car crash over 40 years ago created pain for me. The crash broke my knee and back…but I did not know. (This was added to a serious whiplash gained the year before.) 30 years later was when I finally found out about the back. The knee was discovered just s few years ago after a chain saw accident to the same knee needed Xrays. The Xrays showed that previous break. The wreck was in the 1960s. People were not so careful then. This had been a simple car wreck. No one was killed. There were things to do. So next morning I was back to work. That night (I was working my way though college) it was “back to school” and that was that. Not surprisingly a decade later, at the ripe age of 30, my back pain began. The day is easy to recall. We had moved to London, and I was driving down Wigmore Street in a brown Audi with a business associate. The simple task of turning onto a side road was all it took. I was seized by an agonizing back spasm. I could not get up, could not walk, nor move, nor lie down, nor sit, nor move without stabs of intense pain. Staying in bed for a couple days just made it possible to move. This did not end the pain. The problem grew. Again and again the simplest task would throw my back agonizingly out of whack. Finally in desperation I went to Harley Street back specialists. They poked, prodded, took blood tests and did all types of things. Funnily not one Xray was used. The final diagnosis was “Creaky Joints.” “Some people just have it,” he said. “We can’t do a thing except give you cortisone shots. But let’s wait on this as long as we can.” I fled and lived with continual pain and occasional bouts in bed for the next five or six years. 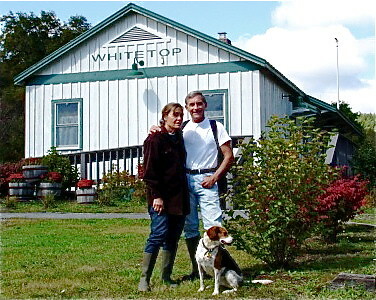 During this time Merri’s holistic and natural living influence grew in my life. She suggested an alternative doctor who used acupuncture. After one especially bad bout that left me lying in bed I was ready to try anything. This was the 1980s and such treatment was still considered off beat in the West. Having lived in Hong Kong for six years, I was open. Plus pain will open your mind to just about anything. The doctor put four or five needles in my arm. I was skeptical…until….the pain literally melted away! To this day over 20 years later that feeling of relief is still with me. I have never had the “laid up in bed” pain again. The continual pain then had been such a daily habit that I felt very strange when I left that chiropractor’s office….not that I was craving to have it back! Nor has it come back with any intensity in all these years. However three years ago pain did return to my left hip and grew, not intense, sudden pain but a nagging ache that never let up… sort of like a toothache. Then one of our helpers at the Meson de las Flores sent me this note: The Sol de Vida spa on the outskirts of Cotacachi has a naturopath who comes to Meson. He is nothing less than a revelation. Everyone here recently had a treatment with him including me. He set up a consulting room in room 114 and one by one ALL of our guests proceeded in. I took the last turn but also translated for the others and learned a lot! He charges $10 for the diagnosis and then $5 or $10 for a treatment. I asked our guests how they rated his services for value on a scale of 1 to 10. All agreed he is a 10! He is very kind, softly spoken and has a gentle sense of humor. He first takes your general history, then your blood pressure and pulse. His pulse reading uses Chinese techniques to gather information about the vitality of your organs. Depending on what he finds, he may also use a pendulum to discover how much energy you have at your Chakra points. He uses a variety of techniques to re-balance you including magnet therapy, lymphatic drainage massages, color therapy, reflexology and acupressure. He also uses heated herbal wraps on the forehead and shoulders as well as therapeutic massages with essential oils. He recommends natural remedies and supplies them at a later date if he doesn’t have them with him. Two of our guests were so taken that they have had 3 treatments with him in less than a week. He helped another client by fine-tuning the focus of his healing efforts and pinpointing what to work on. Another guest stated ‘the treatment was wonderfully enjoyable and very helpful because I now better understand the imbalances in my body and specifically how to handle asthma’. I decided to try the Sol y Vida myself. After an examination I was prescribed 15 days of four treatments a day… electric stimulation…. infra red…. ultra sound and electro magnetic. After the treatments, the pain disappeared and has three years later never returned. My total cost was $10 for the examination and two dollars a day for all four treatments. In all I paid just $40. Now this Ecuador pain center has moved to within walking distance of Meson. Ecuador Living subscribers can learn about the new Ecuador pain center here. 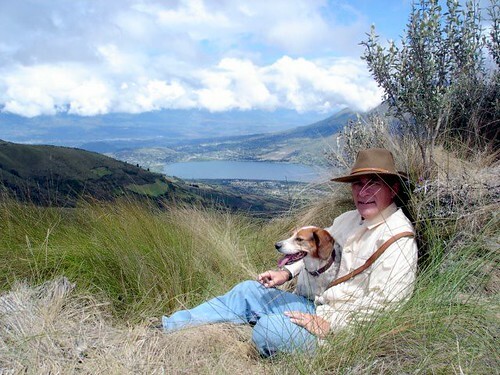 Learn how to be an Ecuador Living subscriber here. 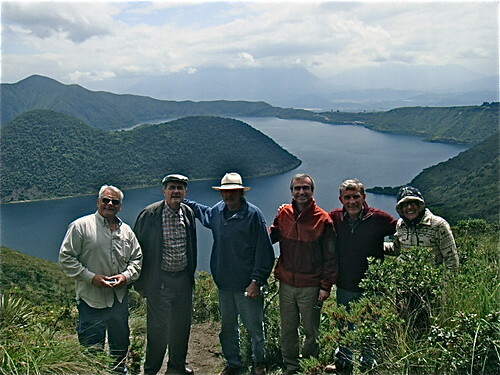 Here I am hiking with friends in Ecuador on the nearby crater lake. Our Super Thinking + Spanish course is about much more than speaking Spanish. This course is about tapping the reserves of the mind. The ability of the human body and mind is virtually limitless. Merri who developed our course was trained by Dr. Georgi Lozanov, the Bulgarian master of education, and he called his system “tapping the reserves of the mind”. Lozanov, a Bulgarian doctor and psychiatrist, didn’t start out to be an educator. He set out to study the nature of man, of the human being in all its potential. He concluded that we are only using a fraction of our capabilities. Lozanov devised ways to open the reserves of the mind and, as a doctor, put them to work to improve the body, to heal mental and physical disease. But in investigating what the whole human being can do, he couldn’t help being drawn into creative and intuitive areas. Then still investigating almost by necessity, he became the leading parapsychologist in the Russian Empire. He realized that with these techniques, the average person could develop Super Memory, could learn factual information with unheard of ease. From this background in the 1960s, the entire USSR began to flourish. Thousands learned languages in 24 days. Skiers returned home from Switzerland and the Olympics with the Gold and Silver Medals. Bulgarian children came home from their ordinary schools in their ordinary streets learning in one month that which previously required one year. Superlearning methods always see us whole, in the round. They have something else in common that’s hard to explain because they are not straightforward. When we begin to operate more as a whole, seemingly inexplicable things can happen. A woman studying a foreign language suddenly finds her sinus trouble has disappeared. A man learning chemistry realizes his intuition has accelerated. An athlete doing body-training techniques finds his concentration improved in mathematics. As obstructive divisions dissolve, all areas of the person can be strengthened learning, better health…. the elimination of pain. Here is the pain reduction idea. Attend our Super Thinking plus Spanish course this September and visit the pain reduction spa at the same time. Combine the power of awakening your mind body potential and this natural approach to relieving pain. Our course schedule gives you time to do both and we’ll be happy to help you make an appointment with the MD. This is why we created our email course Tangled Web… How to Have an Internet Business. This is why if you attend our Ecuador Super Thinking plus Spanish seminar in September I will email you our Tangled Web… How to Have an Internet Business Course (offered at $299) free.